Get a healthy serving of both fruit and vegetables with this delicious gluten-free muffin recipe. 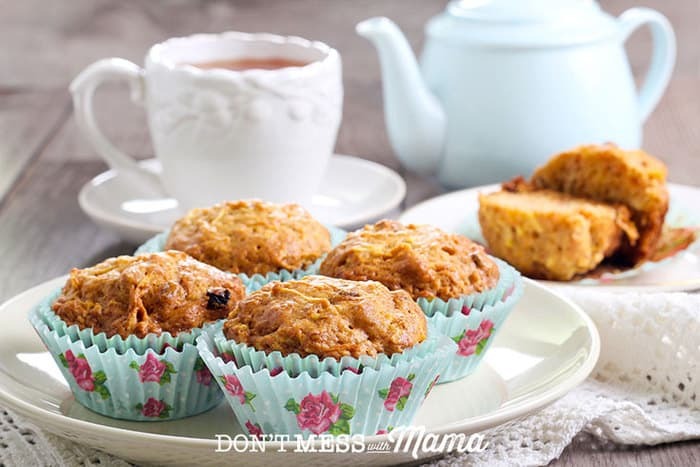 The whole family will love these Carrot Apple Sunshine Muffins. Start your mornings off with this Gluten-Free Carrot Apple Sunshine Muffin recipe. These gluten-free muffins are simply scrumptious and taste just like carrot cake. And the kids love it – without really knowing they’re getting a healthy serving of fruit and vegetables in just one muffin. And the best part is that this recipe is made with real food ingredients and no refined sugar. You can make your own gluten-free flour recipe or you can buy online. I like to make a double batch on the weekend so we can enjoy them as an on-the-go breakfast during the week when we’re short on time for school. This Gluten-Free Carrot Apple Sunshine Muffin recipe also freeze well to enjoy later. That’s why I call these sunshine muffins… you can make them ahead of time and enjoy them in the mornings as a healthy, gluten-free muffin for breakfast or on the go to afterschool activities. 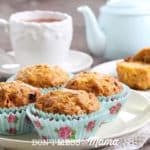 So grab yourself a tall glass of milk or hot tea to enjoy with these gluten-free muffins. These gluten-free muffins are really easy to make and easy to customize. I’ve made them with 2 cups of gluten-free flour (omitting the oats) and it tastes fantastic. I’ve also omitted the coconut flakes and walnuts, and it still tastes great. Pecans also make a great substitution for the walnuts. I get my kitchen pantry supplies like sea salt, black pepper, spices, coconut oil, and other essentials either on Amazon or my local health food store. Get a healthy serving of both fruit and vegetables with this gluten-free muffin recipe. 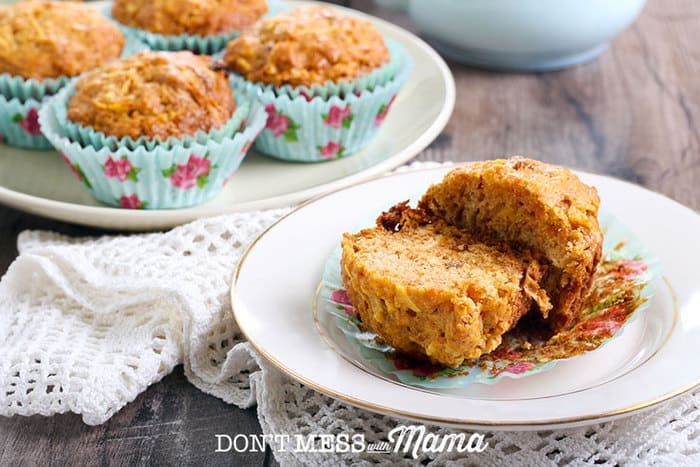 The whole family will love these Carrot Apple Sunshine Muffins. Mix together all of the wet ingredients with an electric mixer. Slowly add dry ingredients until mixed well. Pour into greased muffin pan or cupcake liners about 3/4 full. Cook for about 15 minutes until a skewer comes out clean. Did you try this gluten free muffin recipe? Don’t forget to rate the recipe and comment below to let me know how it went. You can also FOLLOW ME on Facebook, Instagram and Pinterest to see what other fun things I’m getting up to. 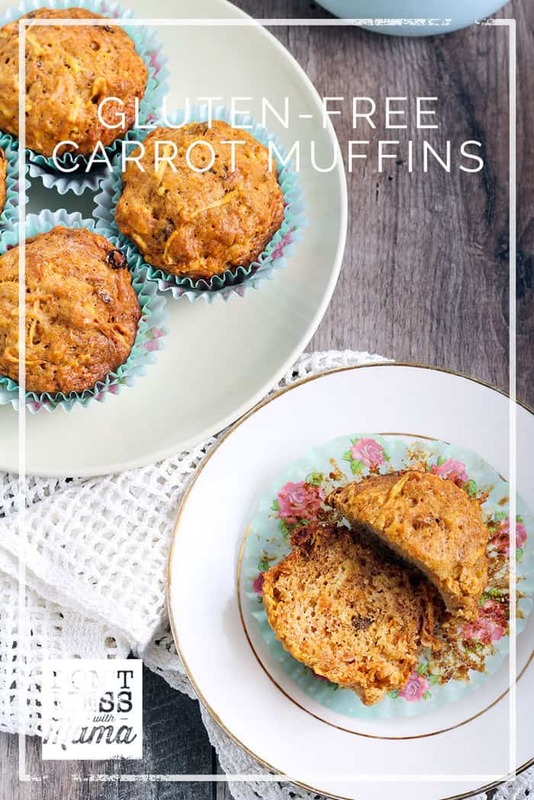 Carrot cake is my favourite cake so these muffins sound right up my street, I need on the go breakfast ideas, thanks! The cups measurement for the flour is cut off by an ad on my phone, could you tell me what it is?